Russia yesterday said it had sent “specialists” to Venezuela under a military co-operation deal but insisted they posed no threat to regional stability, brushing aside a call from US President Donald Trump to remove all military personnel from the country. Mr Trump said on Wednesday “all options” were open to make Russia pull troops out of Venezuela after two air force planes landed outside Caracas on Saturday carrying nearly 100 Russian troops. As Venezuela has descended into political turmoil, Russia has emerged as a staunch backer of President Nicolás Maduro, while the United States backs the country’s opposition and has imposed sanctions. Venezuela’s military attaché in Moscow said Russia had sent “servicemen”, but they would not take part in military operations, Interfax news agency reported. “The presence of Russian servicemen in Venezuela is linked to the discussion of co-operation in the military-technical sphere,” Jose Rafael Torrealba Perez said. Russian foreign ministry spokeswoman Maria Zakharova described the arrivals only as “specialists”. “Russia is not changing the balance of power in the region, Russia is not threatening anyone, unlike [officials] in Washington,” she said. Kremlin spokesman Dmitry Peskov said the specialists were in Venezuela to service pre-existing contracts for the supply of Russian arms. He said Russia was not interfering in Venezuela’s internal affairs and the Kremlin hoped other countries would also allow Venezuelans to decide their own fate. Russia and China have backed Mr Maduro, while the United States and most other Western countries support opposition leader Juan Guaidó. In January, Mr Guaidó invoked the constitution to assume Venezuela’s interim presidency, arguing Mr Maduro’s 2018 re-election was illegitimate. Mr Maduro, who retains control of the country’s military, has said his opponent is a puppet of the United States. Meanwhile, the United Nations has estimated a quarter of Venezuelans are in need of humanitarian assistance, according to an internal UN report that paints a dire picture of millions of people lacking food and basic services. The report’s findings contrast with comments from Mr Maduro, who has said there is no crisis and no need for humanitarian aid, blaming US sanctions for the country’s economic problems. The UN has found itself caught in the middle of the country’s political struggle. “Much more action is required to meet the growing needs of the Venezuelan people,” reads the reads the 45-page UN ‘Overview of Priority Humanitarian Needs’ in Venezuela. It estimates 94pc of the 28.8 million people live in poverty, while some 3.4 million people have fled, with a further 1.9 million expected to follow this year. 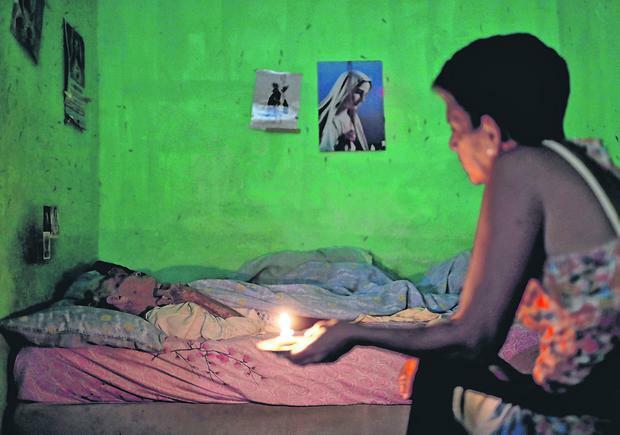 “Due to an increasingly contracted economy and political unrest, the Venezuelan population is facing unprecedented challenges in accessing essential services, including protection, healthcare, medicines, vaccinations, water, electricity, education and access to food,” the report said. There are an estimated 2.8 million people in need when it comes to healthcare, including some 300,000 people whose lives are at risk because they have been unable to access medicines or treatment for diseases like cancer, diabetes and HIV for more than a year. “Preventable diseases such as tuberculosis, diphtheria, measles and malaria have resurfaced and are on the rise, as is hepatitis A, due to the lack of access to safe drinking water,” the report said.